I am ALL about fast meals during the week days. Delicious goodness that can be whipped up in a flash using minimal ingredients and the least amount of dishes. Because if I haven’t told you before, I absolutely loathe washing dishes. I would pretty much rather wash anything else…….laundry, my car, Bella (my pup)–heck, washing an elephant would be infinitely more enjoyable than doing dishes. Pastas are one of my go-to quick fixes where I can throw anything together for a fulfilling meal. This 15-Minute Vegetarian Pasta is so easy to make and can really be modified to whatever you have in the fridge. The end results is a great dish that is rather light and would be perfect for a warm summer night with a glass of pinot grigio in hand. And coming from a carnivorous gal, you won’t even miss the meat while you get down on a big ol’ bowl of this deliciousness. Have an awesome Friday folks and enjoy your Easter Weekend! Boil the pasta for approximately 8-10 minutes in salted water until al dente. Drain the pasta and reserve ¼ cup of the starchy water that the pasta was cooked in. While the pasta cooks, melt the butter with the olive oil over medium heat in a large skillet. Add the shallots and sauté for 1-2 minutes until they start to become translucent. Add the garlic, chili flakes and cook for an additional minute. Pour in the wine and bring it to a boil. Add the tomatoes to the skillet. Stir and cook for about 2 minutes until they begin to burst. Pour the starchy pasta water into the skillet. Once the liquids start to boil, toss in the pasta and sprinkle in the parmesan. Vigorously toss the cooked pasta to evenly coat it with the sauce. Check for seasonings and adjust with kosher salt and pepper accordingly. 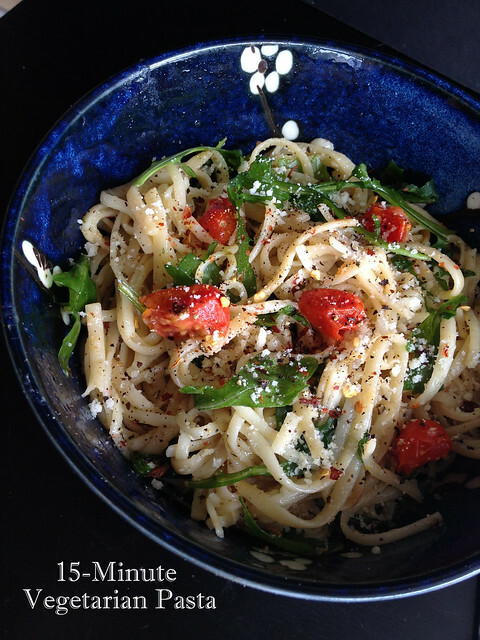 Toss in the arugula leaves and plate the pasta to a dish.